I love the kind of recipes and noms that are so simple and so delicious that they’re finished in under two minutes. This is one of those. Seriously. Combine peanut butter and softened butter in a large bowl with a fork or in a stand mixer. Add the sugars and mix. If the filling will roll easily into balls without sticking to your hands you’re ready to go. If not, add a little more of each sugar until you reach a consistency that is easy to roll. Roll the mix into a small ball in your hands, then sandwich them between two whole pretzels. When all the balls are rolled and successfully sandwiched, stick the whole tray in the freezer for about half an hour. Pour the chocolate chips into a microwave safe bowl with a little Crisco, if you have it, and heat at 30-second intervals, stirring occasionally until completely melted. 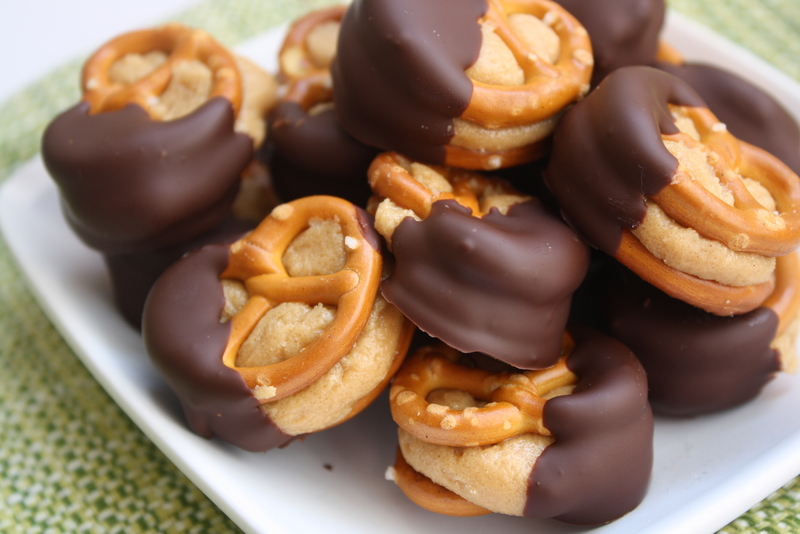 Remove the pretzel sandwiches from the freezer and quickly dip each half-way into the melted chocolate. Put them all on the tray (covered with waxed paper) and place back in the freezer until fully hardened. Then store them in the fridge until you’re ready to serve!